The Festival will feature a mix of local and international mountain films reflecting First Nations culture, the changing environment of Kluane, arts, and outdoor recreation from across the world. The mix of films will be shown on the evenings of Fri Nov 30 (at St Elias Convention Centre), and Sat Dec 1 (at Da Ku Cultural Centre), Haines Junction. Yukon resident Darryl Tait has always been an athlete and extreme sports enthusiast. Fresh out of high school, he was pursuing a career in freestyle snowmobiling with the goal of competing in the X Games. But at the age of 19, a brutal accident left him paraplegic, and could have made him leave his old life behind. Instead, he became a pioneer. 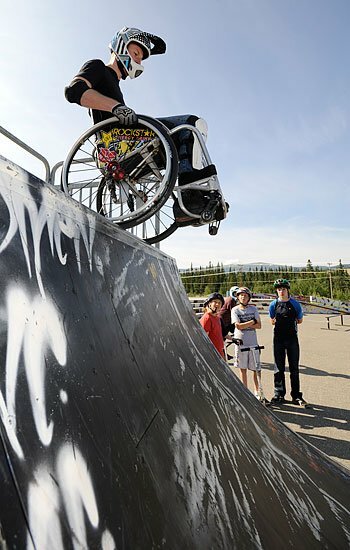 After his accident, he relied on support from his friends and family; the close-knit community in Whitehorse, where he lives; and social media, which connected him to the vibrant, growing world of extreme adaptive sports, such as WCMX, a wheelchair version of BMX biking. He still felt extreme sports were his safe place. Even if he couldn’t ride in the same way as before his injury, he was determined to continue following his passion. “I’m about living life to its fullest potential,” he says.